he idea of different people and cultures coming together through a shared interest is the inspiration for the group exhibition “Supper Club” that kick-starts the year 2017 at Galerie Kornfeld. At the centre of the exhibition is the work “Last Supper” by the Georgian Biennale participant Tamara Kvesitadze, which will have its German premiere in Galerie Kornfeld’s rear exhibition room. 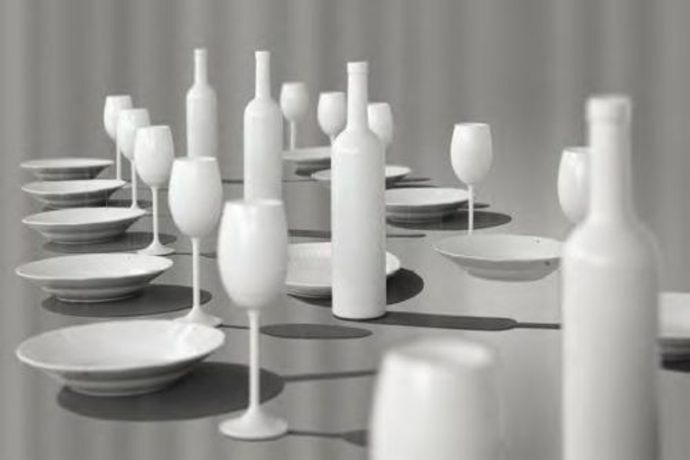 The tradition of the “Last Supper”, as an essential thematic field in Christian-influenced art history, is an important reference point for the choice of topics and motifs, which resonate in the exhibition’s sculptures, photos, paintings, works on paper, and even in the installations. The idea of the “Supper Club”, however, enables the male and female artists to engage with the themes of faith, the banquet and the passion, as expressed in the story of the “Last Supper”, in a more expansive way.